The concept of video marketing is growing – there are even agencies out there that specialize in video marketing, simply because of the uptick in its popularity. There are many ways that video affects marketers – whether it be increased conversions, increased web traffic, or increased engagement on social media platforms. You may notice that the only effects video produces are great ones. So with that, check out more specifics on why video matters to marketers in our latest infographic! To learn more about the stats and information used in this infographic, keep scrolling! Video marketing has recently taken root in companies’ marketing campaigns, and it shows no signs of disappearing — rather the opposite. Video as an advertising strategy is building momentum, and if you’ve been questioning whether or not your business should adopt video marketing, now is the time. If you’re still on the fence, consider that by 2019, 80% of online content will be video. That is a huge percentage, and starkly shows that if you haven’t yet adopted video marketing, not only are you behind, but you’re on track to lose customers in coming years. Still not convinced? Let’s look at six statistics that show why marketers need to use video. Whether you’re at a baseball game, a restaurant, or a movie theater, it’s likely that you see everyone pull out their smartphone once or twice. Smartphone users are consistently viewing and absorbing online content, including video. Matter of fact, mobile video consumption rises 100% every year. This means if your website isn’t yet utilizing video, you’re missing out on tons of potential views, which could lead to tons of potential conversions. If you’re selling products on your website, videos are a great way to sell those products. Not only do they show the specs of the items you’re selling, but it helps users to visualize what they’re actually purchasing. In fact, 90% of users say that product videos help them decide whether or not to purchase an item. This goes to show that if you don’t include product videos on your website, you could be missing out on a huge percentages of potential conversions. It’s a fact that 65% of the population is made up of visual learners. This means that people that see something, rather than hear it, will learn it better and get more out of it. This makes it easy to understand why viewers retain 95% of a message when they watch it in a video, and only 10% when they read it. The visual nature of videos allows users to retain nearly 100% of the material, which means you can’t stand to miss out on such a great marketing tactic! Users will retain information about your product far better via video in comparison to simply reading about it. Companies who utilize videos see 41% more web traffic from search than those who don’t utilize video. Can you imagine nearly doubling your web traffic just by adding an element as simple as a video? It’s totally possible! If you’re looking for a great return on investment, video can help. 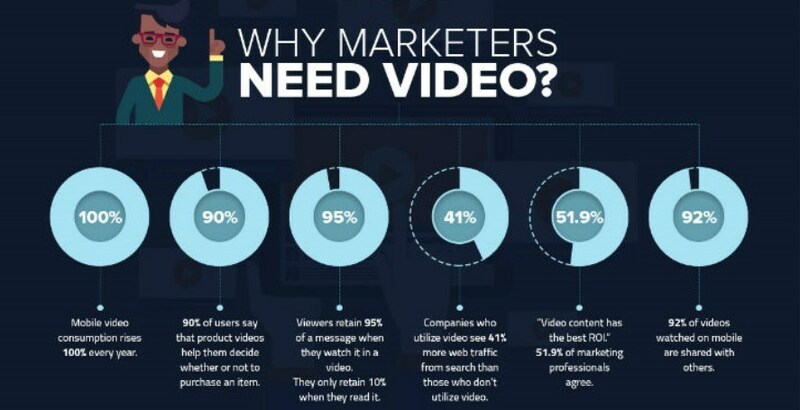 51.9% of marketing professionals agree that video content has the best ROI. Take it from the experts — if you want a great return on investment, video is the way to go. If you want to increase the reach of your content, using a video format is extremely beneficial. In fact, 92% of videos watched on mobile are shared with others. That means it’s extremely likely that users will share your video somewhere down the line — which means increased brand awareness and increased conversions! This shows us that when you post branded videos on social media, you’re bound to get interaction. Facebook is the best place to post your branded videos, but even Twitter, the platform that gets the lowest interaction with branded videos, still yields 22% engagement. Posting branded videos to social media platforms is a great way to advertise your business. Over half of video content is viewed on mobile. This means you need to make your videos responsive across all devices! If half of videos are viewed on mobile devices, that means only half is viewed on a desktop – so it’s crucial that users can also view your videos on any device, of any size. 92% of people who watch mobile videos share the videos they watch with others. This shows that responsive videos users can watch on mobile are a great way to increase brand awareness since they are shared so often. Between 2016 and 2020, mobile video views are set to increase by 11 times. If you aren’t already creating responsive videos for your website, you’d better start if you want them to be successful! According to YouTube, video consumption increases at least 100% every year. Videos are becoming more and more popular — and people want to watch them. That makes them a fantastic way to market your business and stay at the forefront of your industry. 40% of global YouTube watch time is on a mobile device. With nearly half of YouTube’s watch time being specific to mobile devices, it’s crucial that your videos also find a home on YouTube! In the fourth quarter of 2015, mobile video views exceeded desktop views for the first time ever. Desktop video views are still popular, but with more and more people relying on their phones to get information, it’s more important than ever to provide responsive videos on your website. By 2020, smartphones are set to account for 81% of all mobile. With the increase of smartphone usage to surf the Internet climbing, all of your content, including videos, should be responsive, and aware of SEO best practices. What kind of videos are most effective? Customer testimonials: These videos show the satisfaction of past customers, and help future customers decide whether or not to purchase your products or services. They have an 89% effectiveness rating. Tutorial videos: These videos show viewers how to do something, and 30% of people search YouTube for “how-to” videos. Demonstration videos: These videos show someone doing an action, like putting the wheels you sell onto their bike, or tying the hooks you sell onto fishing line. Two minutes or less is the ideal demo video length for great engagement. How does video marketing work in the marketing funnel? Videos help to move people along in the sales cycle, and in other words, help them make their way down the marketing funnel. You can start by enticing users with your videos. There are many different kinds of videos you could use to entice, but the most popular include blog videos, social media videos, and demonstration videos, since they’re all very top-of-the-funnel. Next, you want to interest potential customers with videos. You can do so by keeping potential customers interest with information and special offer videos. Converting is the next step in the marketing funnel. To convert your audience, use videos that close with a contact form, videos that show the value of your products and services, and testimonial videos to prove how great your products are. Lastly, you want to continue the process. You can do so with fun culture videos of your company, informational videos about your industry, videos within emails, and special “customer only” videos. Are you ready to drive results with video marketing? If so, WebFX is here to help. We can help you integrate video into your marketing strategy so that you can entice potential customers, interest them further in your products and services, convert them, and keep them coming back for more. If you’d like to jump into the world of video marketing today, contact us for a free quote!